NexGard Spectra is a monthly chewable treatment for dogs made with soy proteins and braised beef flavorings that dogs love. The new soft, beef flavored chew kills fleas and ticks, now with the added benefit of treatment for heartworms, roundworms, hookworms, and whipworms. 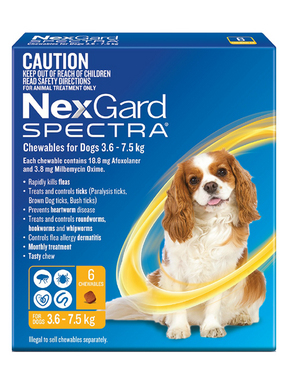 AdministrationNexGard Spectra Chewables can be given with or without food. A convenient single chew that is readily consumed for all dogs in everyday situations. As NexGard Spectra is an oral treatment, dogs may be handled immediately following administration and there are no restrictions on swimming, bathing and shampooing before administration. How it worksNexGard Spectra paralyzes parasitic organisms by interfering with the way signals are passed between nervecells (neurotransmission) in the nervous system of parasites that live in the fur of animals, such as fleas and ticks and then kills it. Afoxolaner kills fleas before they can lay eggs and so helps to reduce contamination of the dog's environment. DosageNexGard Spectra Chewables is taken once a month, safe for all breeds and puppies from 8 weeks of age and 2kg or more. Dogs over 60kg (132 lbs) administer the appropriate combination of whole chewables. BenefitsNexGard Spectra was effective in treating flea and tick infestations in dogs up to 30 days after treatment and reduces the number of fleas and ticks by at least 95%. It is also effective in reducing gut worms and prevents heartworm infection as all dogs tested negative six months after the last treatment. PrecautionsTablets should be kept in the blister packs until required and the blisters should be kept in the carton. In case of accidental injestion, particularly in the case of children, medical advice should be sought immediately and the package leaflet or label shown to the doctor. People handling the medicine should wash their hands after handling the product. Storage Conditions: Store in a dry place at controlled room temperature between 59° and 77°F (15-25°C). A great product and my dog loves it she sees it as a treat every time. I would tell any dog owner this is a must have ! !